Located in South India, 140 kms southwest of Bangalore, 1,177 kms southeast of Mumbai, 473 km north of Madras. No longer has the capital of the princely state of Mysore, this palace-rich city survived as the principal residence of the former royal family. When you see what the maharajas accomplished in the way of arts and culture—not only developing palaces, temples, and school but supporting the traditional. Mysore school of painting—you’ll understand why Prince Jayachamaraja Wodeyar (father of the current prince, Srikandatta Wodeyar) was appointed the first actual governor of Karnataka. Mysore had been known for its progressivism during his reign. 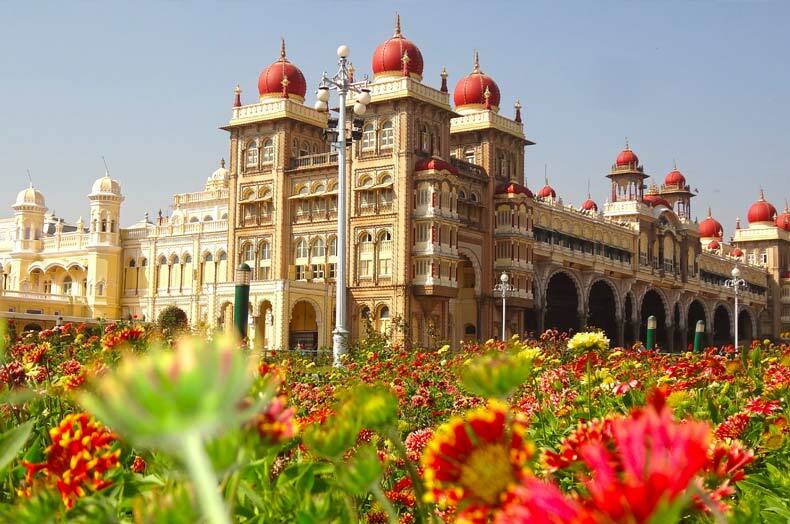 Mysore has been called the City of Palaces. You can explore its main attraction, the Mysore Palace, in a few hours, and if you can manage a stay in the Lalitha Mahal Palace Hotel, the simple combination of the two will make your trip to Mysore worthwhile. An evening visit to Brindavan Gardens is a nice way to experience the Indian fascination with kitschy but charming colored musical fountains. Despite its opulent past, there is nothing flashy or fancy about Mysore, at least not in the modern, commercial sense. There are relatively few places to wine and dine, and the streets are lined with far more dozing cows than boutiques. The congenial climate and small-town surroundings, replete with leafy avenues, make a trip to Mysore enchanting. Here you can admire (and buy) some of India’s richest silks, woven with real gold, and other elements of an age-old spirit of elegance that endures even as it deteriorates over the years. Mysore is a small city, and its center is easy to walk around. 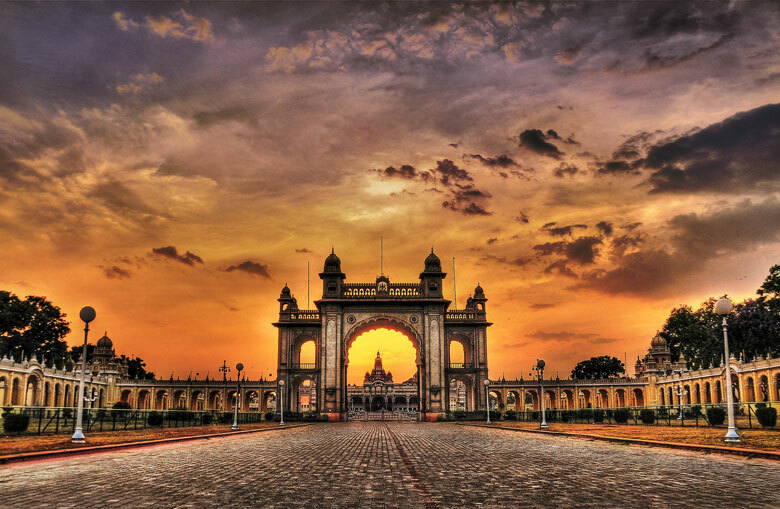 Start your walk at the conveniently central Mysore Palace. Exit on the A 1 pert Victor Road side and turn left; then, at the traffic circle with the clock tower, turn right. On the left you’ll see the entrance to the Devaraja Market. When you’ve had your fill of shopping, return to the clock tower and go back along the Albert Victor Road past the palace. At Hardinge Circle, turn right onto Lok Ranjan Mahal Road. A few more minutes will bring you to the Zoological Garden. After strolling through the gardens, take a taxi to the top of Chamundi Hill for a beautiful panorama of Mysore. Walk down the hill’s 1,000 steps and catch a taxi, bus, or auto-rickshaw back to the city. You’ll need at least five hours for this walk, and probably most of the day if you make it to Chamundi Hill. The distances are not long, but you’ll probably want more than an hour or two at the palace, an hour at the market, and two or three hours at the zoo. Note that the zoo is closed on Tuesdays. Mysore looks its panoramic best from the top of this hill. 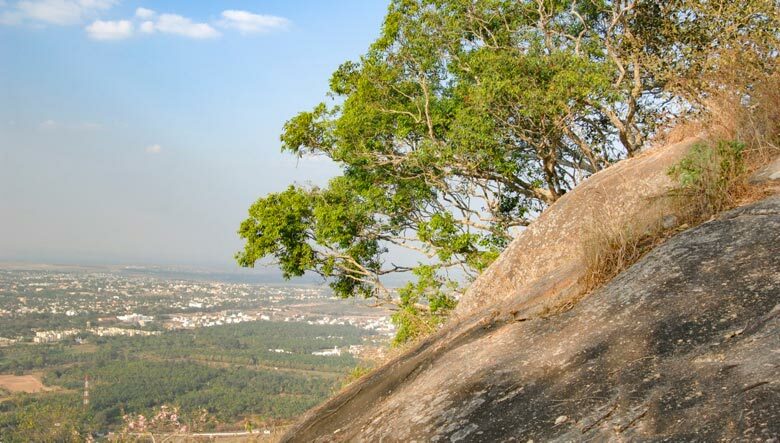 The hill’s 1,000 steps take you past a 16-ft stone Nandi (Shiva’s holy bull), and the Sri Chamundeswari Temple on the summit is dedicated to the royal Wodeyar family’s titular deity, the goddess Chamundi, an avatar of Parvati (Shiva’s consort). The base of the temple dates from the 12th century; the ornately sculptured pyramidal tower was built in the 1800s. Because it’s still an active religious site, the entire area surrounding the structure teems with beggars and peddlers. The temple’s inner entrances are staffed by aggressive priests hassling tourists into buying flower offerings and binds (forehead dots), applied by a fat thumb right between your eyes. Tuesdays and Fridays, auspicious days, are the most crowded. Near the temple is a giant statue of Mahishasura, the demon killed by the goddess Chamundi so that the region would be at peace; Mysore, originally called Mahishur, was named for him. The kitschy Godly Museum has gaudy paintings depicting eternal life and harmony. By far the most impressive structure in Mysore is the maharaja’s palace, a massive edifice that took 1 S years to build (starting in 1897). One of the largest palaces in India, it’s set on 73 acres and designed in the Indo-Saracenic style —a synthesis of Hindu and Islamic architecture. The main rooms and halls are a profusion of domes, arches, turrets, and colonnades, all lavishly carved, etched, or painftd, with few surfaces spared. The halls and pavilions glitter with unabashed opulence: giant brass gates for grand elephant entrances; silver-plated doors encrusted with patterns and figures; richly carved teak ceilings; ivory gods and goddesses; a 616-pound solid-gold howdah. The cavernous Kalyana Mantap (Marriage Hall), where women sat be-hind screened balconies, exudes royal wealth, its turquoise-painted cast-iron pillars soaring up to a translucent dome of Scottish stained glass with brilliantly colored peacocks and flowers. A massive brass chandelier from the former Czechoslovakia hangs far below, above a floor of colorful English tiles. The impressive Durbar Hall, where public gatherings were held, is an elegant historical chamber, with floors of white Italian marble inlaid with semi-precious stones. The present-day maharaja (technically a prince—the last maharaja died in 1974) lives in a private wing at the rear of the palace. The small Residential Museum exhibits the prince’s private collection of artwork and artifacts illustrating royal life of the past. On Sundays from 7 to 8 PM and on holidays, the palace is illuminated with thousands of tiny lights that turn it into a glittering statement of wealth. For the ultimate palace experience, time your visit to coincide with the annual Dussehra festival in September or October, commemorating the victory of the goddess Durga over the demon Mahishasura. Mysore is known for its intensely colorful Dussehra celebrations: For 10 day’s palaces and temples are illuminated and cultural and sports events abound, culminating in a torchlight procession led by an elephant carrying an idol of the goddess herself in a howdah of pure gold. 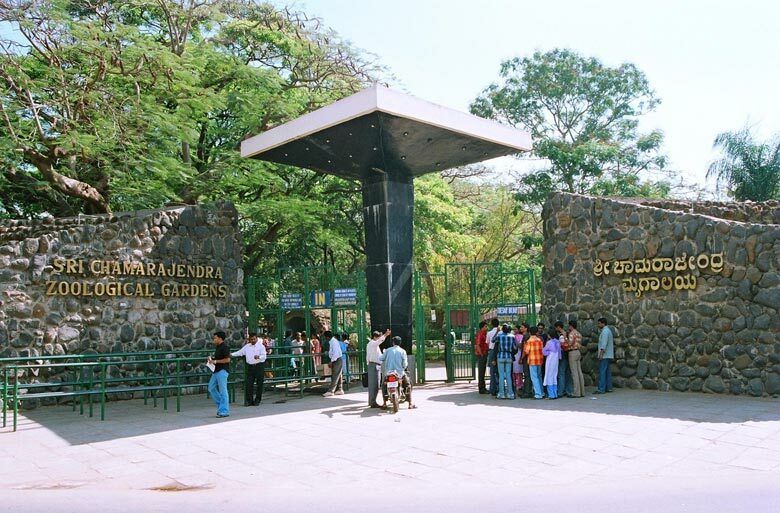 This well-maintained 250-acre zoo is more than 100 years old (founded 1892). Today it’s populated by lions, white tigers, giraffes, African elephants, hyenas, kangaroos, rhinos, and a variety of other animals from all over the world. One section is devoted to reptiles and snakes. A small museum has effigies of rare animals and birds. For more information on Customized South India Tours to Mysore and the other nearby places such as Bangalore, Ooty, Kodaikanal, Bekal, etc, call Swan Tours, One of the top travel companies promoting Tourism in India.